Lock in a great price for EVEN Hotel Miami - Airport – rated 9.2 by recent guests! The food was excellent, the service was awesome!!!! Tony and Manuel are the best! I was picked up on the shuttle from the airport by Tony and he was so kind and willing to help! Manuel got me all checked in and was so patient with everyone who was at the front desk, he is a very good multitasker in a high pressure situation. Both of these guys are keepers and need a raise!! I enjoyed my stay very much!! Amazing hotel and beautiful clean bedrooms! Will book again! 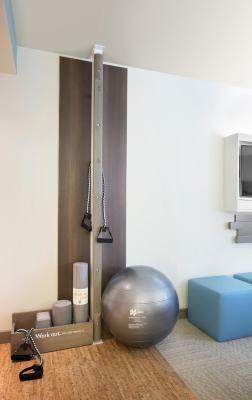 Gym equipments in the room, the details in the way they take care of the towels in the bathroom, the board screen to drive/write whatever you want to. Larry at the restaurant was awesome. He called every guest by their first name and didn't hesitate or slip up once. The atmosphere, the decor, the staff, the food, and the comfort were all fantastic! The property was very well designed, having garage space on your floor made getting back to your room a breeze. The key locks for the floors and the elevators really made the hotel seem like they took your privacy and security seriously. Very quiet. Flatbread was great. Staff was very nice. Loved the affirmations on the wall and the focus on making you healthier. Easy parking lot and close to other travel areas. Loved the ice maker in the hall and water bottle in the room. The beds you can honestly sink in! The staff is amazing!! So helpful so polite! EVEN Hotel Miami - Airport This rating is a reflection of how the property compares to the industry standard when it comes to price, facilities and services available. It's based on a self-evaluation by the property. Use this rating to help choose your stay! Located in Miami, 3.7 mi from Marlins Park, EVEN Hotel Miami - Airport has an outdoor swimming pool and a fitness center. This 3-star hotel offers free shuttle service. The accommodations offers free WiFi, as well as a terrace and a restaurant. At the hotel, rooms have a desk. 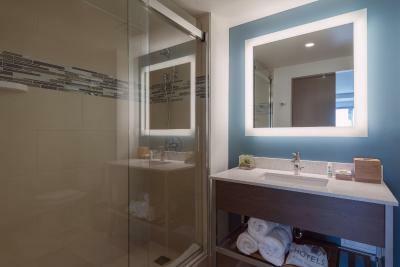 Each room is equipped with a private bathroom with spa inspired showers with bath amenities. 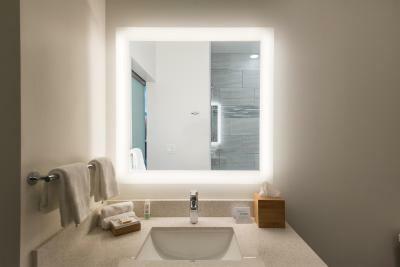 At EVEN Hotel Miami - Airport the rooms are equipped with a wardrobe and a flat-screen TV. Guests can enjoy freshly prepared and heart-healthy food and beverage options served at the full-service Cork & Kale restaurant. For guests' convenience, the accommodations has a business center. With staff speaking English and Spanish, advice is available at the reception. Miracle Mile Miami is 4.3 mi from EVEN Hotel Miami - Airport, while Adrienne Arsht Center for the Performing Art is 5 mi away. Miami International Airport is 1.9 mi from the property. 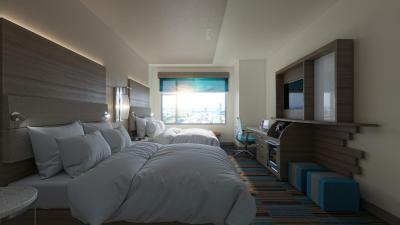 When would you like to stay at EVEN Hotel Miami - Airport? This double room has air conditioning, flat-screen TV and tumble dryer. This family room features air conditioning and tumble dryer. This double room features a tumble dryer, cable TV and air conditioning. This double room has a flat-screen TV, tumble dryer and air conditioning. This suite features a tumble dryer and air conditioning. This suite has air conditioning, tumble dryer and cable TV. House Rules EVEN Hotel Miami - Airport takes special requests – add in the next step! EVEN Hotel Miami - Airport accepts these cards and reserves the right to temporarily hold an amount prior to arrival. The doors are really heavy. You must force them to enter in the room. There’s no lights over the bed. Breakfast should be normal (with bread and all the non fitness food). The entire experience was great, with the one major exception being the water pressure in the shower. 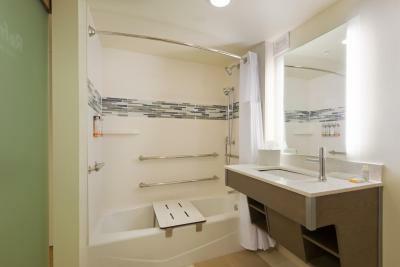 For me, when I stay somewhere, the 2 main things I require are a comfortable bed, and a great shower. With the horrible water pressure, I wasn't able to wash the product from my hair completely, and it makes for a horrible hair day, which just ruins the entire day in general. I understand y'all are trying to conserve water, but I actually ended up taking a much longer shower trying to rinse off, so I feel like I used more water in the long run. You should re-think your low pressure showers. As great as everything else was, I won't stay in this hotel again because of the shower. No complimentary breakfast. "Cork & Kale" Cafe, on site, was very expensive and servers did not acknowledge us until 15 minutes after we arrived. After that, the lady serving us was very nice and helpful. My husband found it hard to sleep with the airport flight noise. Room loud with activity all night in halls. They took off 150€ from credit card during reservation on booking, and when I got there they asked to pay. I said that they took money from credit card and they answered that money will be returned on credit card. After one month money never came back!! !